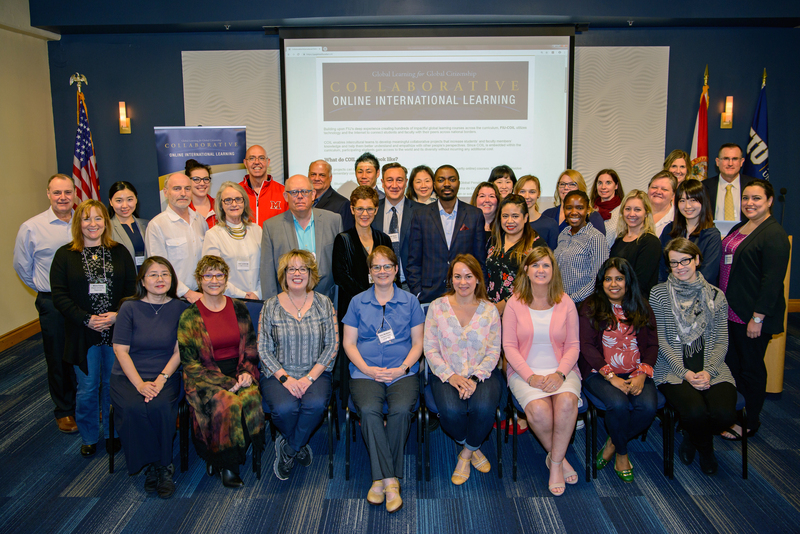 FIU Global Learning’s COIL Leadership Institute is helping universities from across the nation and globe incorporate Collaborative Online International Learning (COIL) into their curricula and internationalization plan. In collaboration with Media Technology Services (MTS), the Kimberly Green Latin American and Caribbean Center, and COIL Consulting, FIU’s Global Learning recently hosted twenty-nine leaders of higher education from around the globe at its first annual COIL Leadership Institute. For two days, March 4-5, participants explored possibilities of developing a COIL initiative at their institutions. The goal of the Institute was to enable colleges and universities formulate a plan for initiating and supporting an array of COIL courses at their home institution. Developed over the past fifteen years, COIL (also referred to as Virtual Exchange or Telecollaboration) is a method for connecting teachers and their students with peers in other countries via the Internet. The model involves in-depth cooperation between paired teachers from two different, often distant universities, who have students collaborate in small groups for four to six weeks to complete shared projects that address challenging real-world problems like protecting threatened marine areas or reducing gender violence. Students combine their diverse perspectives to generate unique solutions that are viable across cultures. Students in COIL courses meet and work with their international peers online either asynchronously or in real time, often using free apps such as WhatsApp, GoogleDocs or Padlet. FIU is a model on how to incorporate COIL on a university-wide scale and currently has 15 faculty COILing their courses in disciplines as diverse as marine biology, Italian, business, journalism, English, Asian Studies, history, education, and hospitality and tourism. Five faculty are COILing with professors at Brazil’s premier technological college, FATEC. Participants interacted with FIU’s COIL faculty and learned a systematic approach to strategic planning for COIL as well as benefited from presentations from a variety of COIL experts including, Jon Rubin, COIL Consulting; Stephanie Doscher, director of OGLI; Matt Hagood, director, and Arden Napier, instructional designer and adjunct professor, of MTS; Jenifer Cushman, chancellor of Penn State Beaver; Joan Landeros, former director of the Centre for International Education at Universidad La Salle, Mexico; and Osvaldo Succi of FATEC. “If you want to walk away with a fully developed work plan for implementing COIL at your institution, the FIU COIL Leadership Institute is the place to go,” said Sally Mudiamu, director of International Partnerships at Portland State University.